Ptl. Kelsey Hedrick who has taken on the role of Historian for the Police Department for his assistance. Additional sources used are the Review newspaper and the book Hills & Kilns by William Gates Jr. Between 1865 and 1890 major crime was not a significant problem in East Liverpool. Minor crimes, however, offended the sensibilities of many Victorian era citizens and were a constant concern of city officials. In 1866 Council stipulated that it was the duty of the town marshall to arrest any person who violated any existing ordinances and made it illegal to disturb the peace by " ... clamour and noise in the night season, by fighting, using obscene and profane language in the streets, or other public places, to the annoyance of its citizens, or otherwise violating the public peace by indecent and disorderly conduct, or by lewd and lascivious behavior. ... " Of course the passing of an ordinance meant relatively little in terms of actual enforcement. A group of dissatisfied citizens met on 10 February 1866 at the schoolhouse to devise ways and means by which village authorities could be more effective in their efforts to "... suppress the riotous conduct now rife in our midst." The group, including Josiah Thompson and William H. Vodrey, called for more stringent laws and an increase in the number of policemen. These gestures and the town's response were typical of the times; in reality, before 1875, there was little need for alarm, much less the existence of a formal police force. The mayor divided the growing city into four police districts in 1884. In that same year the city council approved a salary for the city marshall and allowed policemen and night watchmen to collect a percentage of the fines of convicted criminals. All of the members of the police force were required to wear a navy blue uniform with police buttons and a silver star. Every person appointed to the force also had to meet the following requirements: be a United States citizen able to read and write the English language, be a twenty-one year old resident of the city} and have a "good moral character" and be of "steady habits and sound body." While on duty he was required to " ... maintain decorum, command of temper, patience and discretion... ." Day policemen worked from seven a.m. to ten p.m. and the night shift patrolled the city for twelve hours beginning at six p.m. 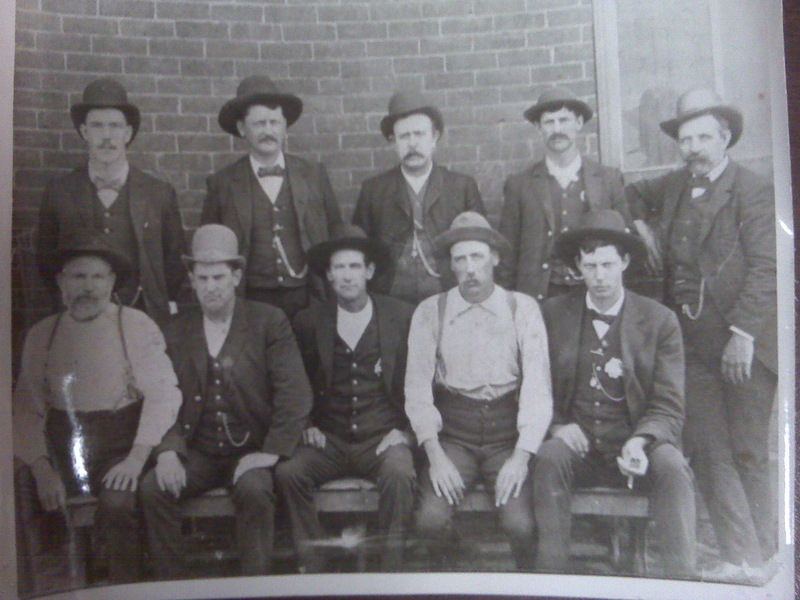 The East Liverpool police force was also issued revolvers for the first time. In 1888 council approved Mayor Burgess' request for additional policemen, thus providing the city with an adequate force. For the most part, East Liverpool remained relatively free of crime, partly as a result of its police protection and in part because the city had not yet attained proportions in which crime was a major factor. 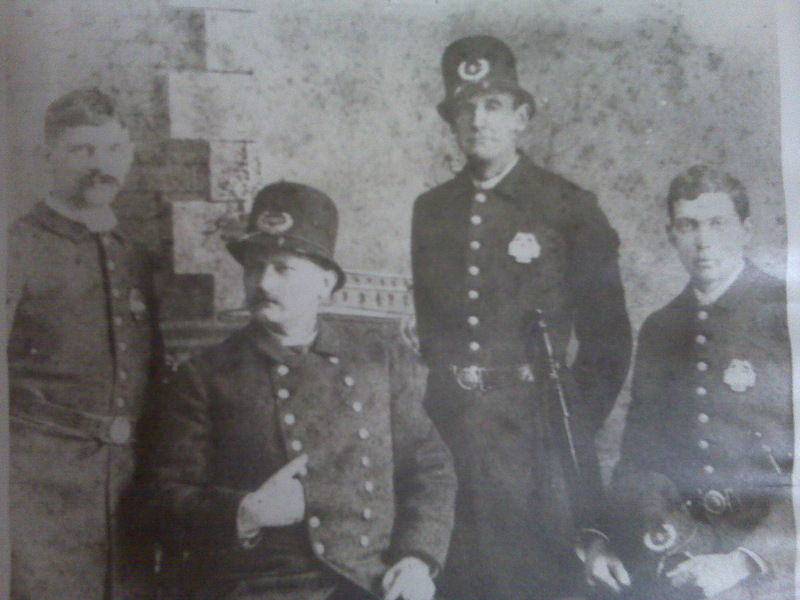 [CHAPTER 6 - 1890-1910-229] In June of 1893 two policemen were added to the force, bringing the total to five. Additionally, a regular schedule of hours and "beats" for patrolmen was instituted for the first time. One officer worked during the daylight hours and the other four patrolled the streets in the evening. C.F. Bough was elected mayor of the city in 1898 on a law-and-order platform and city council met soon after to consider increasing the size of the police force by two to eight new men. Councilman Ashbaugh felt that East Liverpool was under-protected for its size. He pointed out that York, Pennsylvania, with a population of twenty-five thousand people, maintained a police force of twenty-two officers. Steubenville, whose population of fourteen thousand was less than that of the "Crockery City," had three more policemen than its upriver rival. In spite of these arguments and citizen support for Ashbaugh's efforts, council did not appoint additional officers to the five-man force. They did, however, provide each man with a uniform, a badge, a revolver, maces, and nippers. 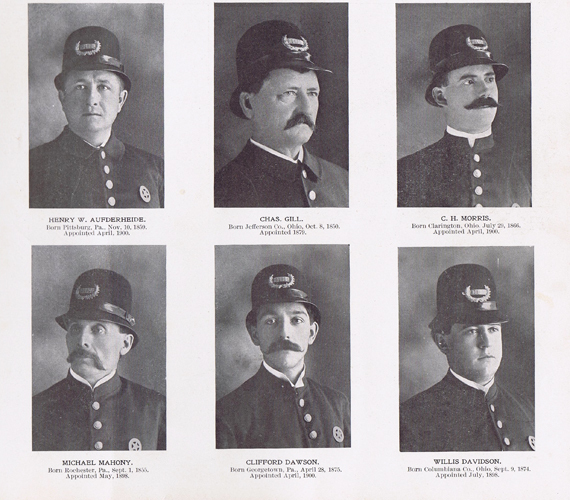 The police force was not expanded until 1900, and then only by one man. A six-man force for a city with a population	exceeding sixteen thousand was wholly inadequate. In at least one news article about recent 100th anniversary of the East Liverpool Police Departments formal organization, reference was made to the first Chief. I'm not one to dispute the records of the department or its historians, but the articles, in my opinion, failed to note the important law enforcement role played by John Wyman, the town's first law man and among its most controversial. Wyman, elected marshal in 1880 as the city's first authentic policeman, was almost killed performing duties as Columbiana County Sheriff in 1890. He was wounded in capturing Ira Marlatt of Fairfield Township who had just shot Barak O Ashton of Fairfield Township to death and wounded another man in a dispute over a real estate note settlement . Marlatt, 30, a farmer, had returned home after the killing, barricading himself inside. Sheriff Wyman arrived and called on the suspect to surrender. Marlatt warned Wyman not to enter, and went upstairs into a bedroom locking the door . Wyman smashed through the entry door, went upstairs and broke down the bedroom door. As the lawman entered, Marlatt fired his .32 caliber revolver. The bullet passed through the double fold of the Sheriff's overcoat, an undercoat, vest, pants and underwear, causing a painful flesh wound of the abdomen. The Sheriff grappled with Marlatt, subdued him and took him to the County Jail. Wyman was in his second term as Sheriff. 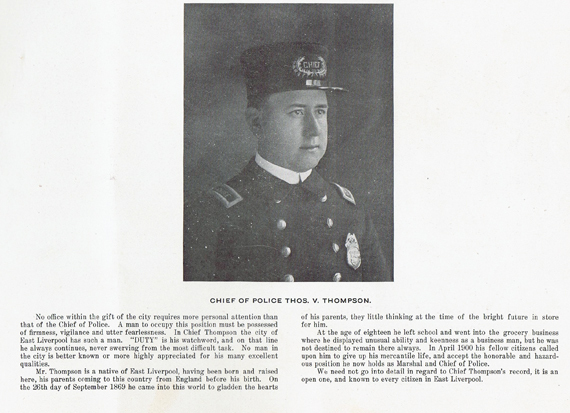 According to research I conducted several years ago, he later became the city's first official police chief in 1903. A Pennsylvania native, Wyman was the son of an immigrant German stone mason and Irish mother. He married a Pennsylvania woman, coming here to work for three years in local flour mills. He served as town marshal for 12 years -- elected six times. He lost his first bid for Sheriff, but was elected in 1887, serving two terms. Wyman later was the central figure in a political/legal battle over his appointment as police chief. When in 1903 the state legislature placed municipal police departments under civil service, Wyman's record made him the leading candidate to head the city force. Mayor W. A. Weaver appointed him chief of the department which numbered only seven. The appointment was contested, some police officers and political foes arguing that applicants had to come from the ranks and pass an examination. The controversy carried all the way to the Ohio Supreme Court which in 1904 ruled that since there was no police chief in the city when the code was adopted, one had to be created. Thereafter, the code would apply, and an examination must be held for applicants on the force. At one time in his career, Wyman was a candidate for the Republican nomination for Mayor. Wyman and his wife, Harriet, had two children. Mrs. Wyman became an invalid late in life, arid required extensive care by her husband and family before she died the year he became chief. After he resigned from the force in 1917, he served briefly as school attendance officer, but resigned because of poor health. He had remarried to Mrs. Esther Fluno, sister of his first wife. Around 1923, they moved to Los Angeles where he died in 1925 after a short illness. He was 81. Wyman's own family was victim of violent death. A stepson, Charles Fluno of Los Angeles, was killed in a fight with a fellow teamster in 1910. The latter was arrested and charged with manslaughter. Another man described at times as police chief in 1898-1902 was Alfred Johnson who was elected Columbiana County Sheriff in 1904. He was born in East Liverpool in 1847, son of parents who had come from England. In 1875 he wed Anne Caroline Gransebaugh of East Liverpool. Johnson was a pottery dipper before becoming a law officer. Elected Sheriff for two 2-year terms, he was seriously injured getting off a street car in Girard, and died in 1906, aged 59. He was survived by his widow, two sons and three daughters, two at home and Mrs. Robert Wells, wife of the chief deputy sheriff who was appointed to succeed his father-in-law. Thomas "Tim" Viney Thompson, a city marshal, was listed in some sources as Police Chief prior to the state's municipal code which established the position of chief. He was elected city marshal as a Republican in 1900, and was re-elected in 1902, serving a shortened term due to the revised law creating a chief . Thompson was born in East Liverpool in 1869, son of Thomas and Anna Viney Thompson who had immigrated from England. He left school at 18 to join his mother in the grocery business on Washington St. Nominated as the Republican candidate for Mayor in 1905, he was defeated in the general election by W. A. Weaver. He then entered the real estate and insurance business. He was married in 1902 to Mary Smith of Pittsburgh. Early in 1911, he announced his candidacy for Mayor, but was stricken at his office in the Potters Savings & Loan Building, and was taken to his Jefferson St. home where he died two days later, aged 41. Another entry in the Chief post was Charles Gill who in 1879 was appointed by Marshal Wyman to the city's law enforcement department. In 1886 Gill was elected town marshal, and Wyman became deputy marshal. Gill had been born on a farm in Jefferson County near Rayland in 1850. When he was about 14, the family moved to Illinois where the father worked as a farmer and young Charles learned the plastering trade. The family returned in 1872 to Bridgeport, Ohio, and Gill married Mary Jane Barcus of Harrison County. He came to East Liverpool as a plasterer in 1877, then joined the police force here under Wyman. After election as Marshal, a post he held for five two-year terms, Gill was twice elected Sheriff, retiring in 1900. The family moved back to East Liverpool, and Gill was appointed to the police department by Mayor Will C. Davidson. In 1905 he was named a Liverpool Township Constable to fill out an unexpired term. He held the office four terms . In 1914 he was elected Justice of the Peace, and was twice re-elected. He also served 18 years as a deputy sheriff. In 1921 he ran unsuccessfully for Mayor. Gill died in 1924, at his 1320 St. Clair Ave. home after stricken with pneumonia. He was 73. Survivors included three daughters and a son.